Of all the versions of Frankenstein out there, of all the knock-offs, rip-offs, reimaginings, references and reinventions, this particular Syndrome is one of the best. At its core, Mary Shelley's Frankenstein was always a cautionary tale about man playing God. Within its slight Gothic horror conceits was a warning about wielding the power only an omniscient Almighty could command. Giving life, and more importantly, reintroducing same to that which the Lord has seen fit to take away was and is a major moral, ethical, psychological, and physiological issue. It stands at the very precipice of our notions of progress, possibilities, and our superstitious past. Shelley obviously wanted to challenge the precepts of those wishing to be 'the Creator', but she lacked the vision to take the idea to its logical ends. 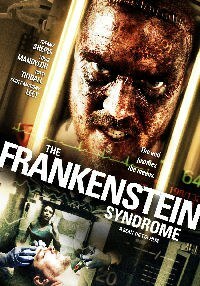 In the fascinating new film The Frankenstein Syndrome, writer/director Sean Tretta mixes contemporary with old world beliefs to offer up a version of the Modern Prometheus that not only challenges our notions of medical right and wrong, but takes on concepts both biological and theological. Elizabeth Barnes (Tiffany Shepis) is a promising young doctor whose work with human stem cells is quite revolutionary. When her mother is diagnosed with cancer, she agrees to work for megalomaniacal medical tycoon Dr. Walton (Ed Lauter) in his secret, highly secure lab. Along with fellow scientists Dr. Victoria Travelle (Patti Tindall), Dr. Ira Gordon (Noah Todd), Dr. Neeraj Sahir (Sebastian Kunnappilly) and Dr. William McKennin (Jonathan Northover) , they hope to use advanced gene splicing techniques and other risky procedures to reanimate dead tissue - or better yet, restore life to the no longer living. Of course, they need 'material', and access to human subjects, requiring the hulking handiwork of Walton's diabolical right hand man, Marcus (Louis Mandylor). When one of the group's mistakes comes back to haunt them, the doctors have no choice but to try their experimental serum on a man named David Doyle (Scott Anthony Leet). Not only is the trial a beaming success, but it gives its subject almost supernatural powers, something Elizabeth and her coworkers can't comprehend...or fully prepare themselves for or protect themselves from. Of all the versions of Frankenstein out there, of all the knock-offs, rip-offs, reimaginings, references and reinventions, this particular Syndrome is one of the best. It takes the core elements of Shelley's story - the creation of a creature and its fatal reanimation - and turns it into a study of white slavery, abortion, the God complex, false prophets, true Messiahs, misguided medical ambitions, and the infighting amongst a group of desperate geniuses. While Tretta has a hard time keeping everything fresh and lively, he does imbue his narrative with a sense of novelty that's hard to ignore. You just don't find this level of seriousness within such genre contrivances. Because he is dealing with such hot button issues like stem cells, fetus harvesting, human trafficking, ethical misconduct, corporate control of science, and a boundaries of man's use of knowledge, he has our attention. But thanks to some stellar storytelling and some equally wonderful work both in front of and behind the lens, what could have been a crapshot comes close to being a classic. There are really two totally different ideas at work here. One sees Shepis going overboard with her ambition and bility to alter the limits of technology. As her arc rises and falls, we get the normalized version of how this kind of material usually plays out. It's compelling, but wholly common. On the other hand, Tindall's Dr. Travelle walks another peculiar path altogether. She is Mother Mary to her unusual immaculate conception, a means of bringing God one step closer to the people he is destined to rule. The whole superiority notion of David, his growth from goon into potential God is something to behold. It's an angle we don't expect, and we definitely don't expect it to be handled in such a smart and satisfying way. Some of the more gruesome elements are a tad staid and/or sloppy, but for the most part, the serious undercurrents are cared for in a concrete manner. Granted, Tretta sometimes goes overboard in striving to be bother artistic and aggressive. David's life as a mixed martial arts style fighter is featured in weird flashbacks that make little sense, and anytime Dr. Walton is referenced, it sounds like Ed Lauter's voice has been dubbed in. The gore sequences are more suggested, staying within the less exploitative framework of the film as a whole, but we miss the moments when 'eureka' gives way to ick. Also, Tretta tries some things that don't work. When one of the many subjects turns feral, literally puking up black bile blood, we recognize the rip-off. Similarly, David has a moment when his head seems to shake in a wholly inhuman manner. Again, the nod to another's work is blatant. Yet like Re-Animator, which found a way to marry Shelley with the lunacy of Lovecraft, The Frankenstein Syndrome takes a tired property and pumps it full of vigor. We are curious where all the machinations will take us, how the "monster" will defy and decry expectation. We need the various terror talking points and yet don't want them so obvious as to overwhelm anything original. Because the cast is so fully supported and eager to help their handler, we get the best of both worlds - a movie where we believe everyone involved in it (even vicious psychopaths like Marcus and David) and where everyone involved in it keeps things believable. While some of the subplots and a few of the asides don't add up to much and the payoff promises something the movie might not be willing to breach, this is still a bold, audacious statement. Sometimes, playing God can advance the cause of man. In other instances, it can be mankind's doom. In the case of The Frankenstein Syndrome, it's a little of both, and a lot of serious fright night fun.